If there was one premium digital camcorder that was really tough to beat back in 2015, it was the Panasonic HC-VX870. Critics praised the $800 camcorder for its sharp HD and 4K quality and plenty of great features. It was a stark reminder on how awesome it is to own one of these things compared to a smartphone that can 4K video. You have to remember the big roles things like lenses, microphones, sensors, form factor and manual controls play. This is the kind of features to expect from a modern high-model and the tough competition continues to challenge companies like Panasonic to innovate. Panasonic did a lot with the Panasonic HC-VX870 to the point that its successor – the Panasonic HC-VX981K doesn’t offer many new features but it is a necessary refresh that makes this camcorder a more attractive package. The Panasonic HC-VX981K is the 2016 replacement of the VX870 and now serves as Panasonic’s most affordable 4K camcorder if you don’t want to take the older models into account. It still remains an interesting piece of technology because it has a huge feature set but weighs less than a pound. It is still heavier than Panasonic’s cheaper camcorders but the overall look and feel still puts this device in the category of compact camcorders. It may not be the kind of camcorder that professional cinematographers would use but we are also in the age where people make movies with iPhones and the Panasonic HC-VX981K totally fits the bill better in terms of overall video quality. As mentioned earlier, the HC-VX981K doesn’t really reinvent the wheel and retains a lot of the key specs including the 1/2.3-inch backlit sensor, LEICA Dicomar 20x optical zoom lens, wireless camera support, 3-inch touchscreen and overall look. The main new addition pays tribute to the many people that still own a 1080p display. Naturally, there is no serious reason to own a 4K camcorder if you don’t have any screens with 4K support. 4K videos are very big in file size and you can’t really appreciate the quality if you view the video on a screen with a lower resolution. The Panasonic HC-VX981K makes the 4K specification more useful for folks that simply want higher quality 1080p video. While all 4K camcorders including the HC-VX981K have the option of recording in 1080p and the results are pretty good, the Panasonic HC-VX981K has additional approaches in getting superior results. Panasonic incorporated special in-camera editing solutions that let you convert 4K videos into focused 1080p videos without any complicated software. “Focused” is the main keyword because this process doesn’t involve downsampling the video but instead involves basic editing functions like cropping and zooming. By recording in 4K video and using the editing option to “snip” a 1080p portion of the video, you get a far more stable and focused result as opposed to natively recording in 1080p. There are several approaches you can do it depending on the desired outcome. You can have the video zoom to 1080p without changing the angle or you can create a cropping area instead over the subject and keep it focused. You can also do panning or sacrifice the 4K resolution for more stable 1080p footage. The Wireless Twin Camera feature found in the HC-VX870 is also getting a minor improvement. It still works the same way in the sense that you connect both the camcorder and smartphone to a Wi-Fi source and link both devices together using the Panasonic Image App. The app has a special feature where you can utilize the smartphone’s camera and have the live footage appear layered on top of the live footage of the HC-VX870 in picture-in-picture form. This gives you the unique flexibility of recording another angle of a scene or an entirely different scene all at once. With the HC-VX981K, you can still do that but you can also connect two additional smartphones into the mix. You are limited to a maximum of two picture-in-picture windows but the third mobile device can cycle with one of the picture-in-picture windows. This isn’t a feature that will be commonly used since it is difficult alone to record with both a camcorder and a smartphone but it could be a fun feature to use if you have friends or relatives with spare iOS or Android smartphones and want to record too. Incorporating two picture-in-picture windows into another video can be tricky and time consuming without the right software making this new addition a fun and worthy feature. The Panasonic Image App isn’t just about the cool picture-in-picture feature. It serves as the main console for the camcorder’s built-in Wi-Fi. Panasonic continues to develop the app and as of right now, it is pretty robust. It lets you do normal functions like upload video directly to social networking sites and it provides a nice touch interface for remotely controlling the Panasonic HC-VX981K or pretty much any other modern Panasonic camcorder or camera that has built-in Wi-Fi. NFC is built into the HC-VX981K too allowing modern Android devices with the app installed to easily establish a connection to the Panasonic HC-VX981K by tapping the devices together. Performance of the HC-VX981K remains unchanged from its predecessor. You are still limited to recording 30 fps in 4K resolution in MP4 format only and the small battery can only withstand less than an hour of 4K footage in a single charge. Still, the manual controls are impressive and the hybrid optical image stabilization means you can record as it is or use the 20x optical zoom to get real close while still getting appreciable results. • Now useful even for people that don’t care about the 4K resolution thanks to the new in-editing functions. • Multiple smartphones can participate in the picture-in-picture feature. • Still very good video quality crammed in a small package. • Average battery life especially when recording 4K video. 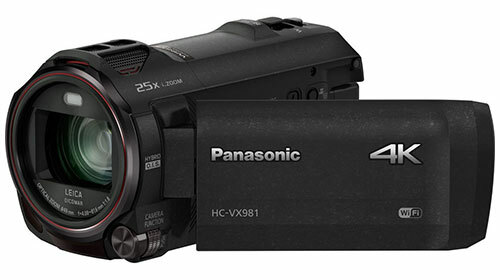 • Not too many improvements making the Panasonic HC-VX870 an appealing camcorder if priced much cheaper. Picking the Panasonic HC-VX981K over the older VX870 is a matter of deciding if the in-editing features is worth considering. It does make the camcorder a more worthy thing to own if you are still going through the transition from a 1080p screen to a 4K one. But since there are virtually no other improvements, it is best to check the price of the VX870 if you simply no longer care about 1080p or don’t wish to go through the hassles of editing 4K video.